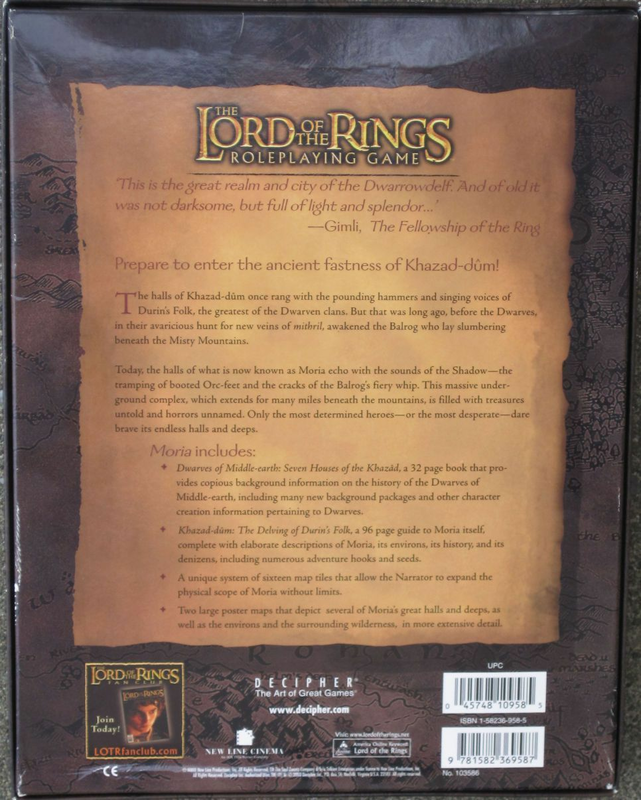 Lord of the Rings Moria Role Playing Game Box Set includes Dwarves of Middle-earth: Seven Houses of the Khaz�d, a 32 page book that provides copious background information on the history of the Dwarves of Middle-earth, including many new background packages and other character creation information pertaining to Dwarves. 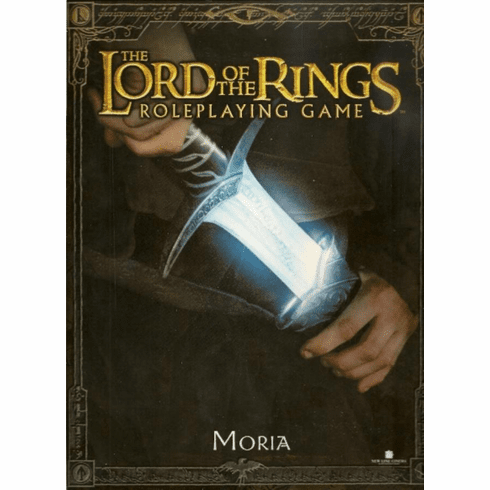 Khazad-d�m: The Delving of Durin's Folk, a 96 page guide to Moria itself, complete with elaborate descriptions of Moria, its environs, its history, and its denizens, including numerous adventure hooks and seeds. A unique system of sixteen map tiles that allow the Narrator to expand the physical scope of Moria without limits. Two large poster maps that depict several of Moria's great halls and deeps, as well as the environs and the surrounding wilderness, in more extensive detail. The halls of Khazad-d�m once rang with the pounding hammers and singing voices of Durin's Folk, the greatest of the Dwarven clans. 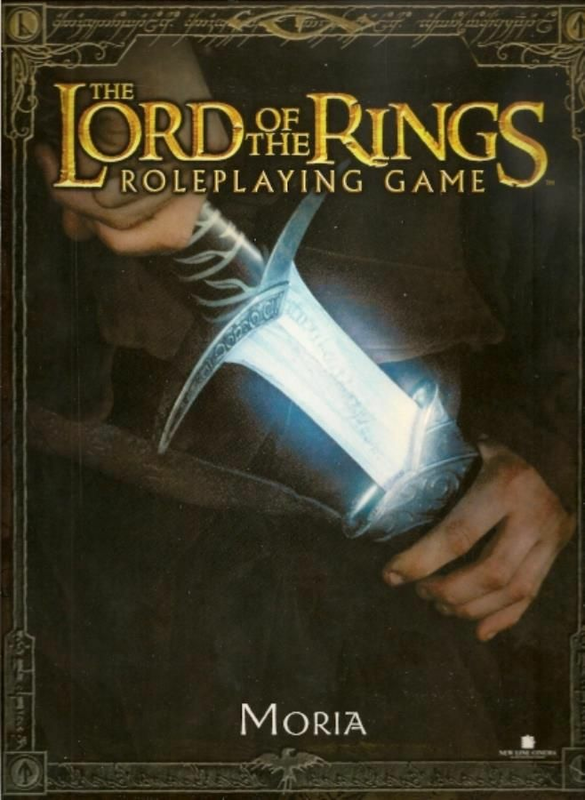 But that wsa long ago, before the Dwarves, in their avaricious hunt for new veins of mithril, awakened the Balrog who lay slumbering beneath the Misty Mountains. Today, the halls of what is now known as Moria echo with the sounds of the Shadow - the tramping of booted Orc-feet and the cracks of the Balrog's fiery whip. This massive underground complex, which extends for many miles beneath the mountains, is filled with treasures untold and horrors unnamed. Only the most determined of heroes - or the most desperate - dare brave its endless halls and deeps.